And if, after all that success, you still need even more yield and potency – then pH Perfect® Connoisseur may be the right base nutrient for you. No expense has been spared in researching, testing and sourcing only the most potent, powerful ingredients, guaranteed to drive your crops to their most productive grow and bloom phase possible. Plus, all primary, secondary, and micronutrients in this flagship formulation are fully or partially chelated for optimal absorption. And if that weren’t enough, you can throw away your pH meters and pens forever because pH Perfect® Technology automatically keeps the pH in the “sweet spot” every week of your grow. It’s said that Albert Einstein called compound interest the most powerful force in the universe. Our team of 21 PhD’s, led by a man named Dr. Savov, developed pH Perfect Connoisseur with this in mind. Drawing from a Japanese engineering breakthrough called “kaizen” (pronounced K-eye-zen), our team applied the power of compound interest to developing compound improvements for your high-value plants. 1. The selection of the nutrients themselves. While most nutrient companies rely on past research and hearsay, the team at Advanced Nutrients wanted facts. So through a series of exhausting plant-specific, tissue sample tests, the team isolated every variable they could. Then, they asked a series of small questions. Including, what’s really going on here? Can we improve this element in some small way? Can we improve the way it works with all the other ingredients? When they were finally able to answer all these questions with authority, the results of the formulation they invented were beyond question. 2. The delivery mechanisms. Once the “building blocks” of the formula – the nutrient selection – was optimized, they realized it would all be a gigantic waste if this new formulation, as powerful as it was, couldn’t be absorbed easily and reliably by your plants. So they tested surfactants, amino acids, and every imaginable ingredient or combination of ingredients possible to enhance your plants feeding. After optimizing the delivery mechanisms, the plants fed this new formulation couldn’t help but absorb almost every last drop! 3. Any other small improvements? This is where the team truly found the potential for huge leverage … over not just the industry standard but even Advanced Nutrient’s best nutes so far. The point of leverage was in plant bloom metabolism and floral production. There were weak links in the armor of most base nutes, and when Dr. Savov’s team discovered them, the team did what they do best. Patiently, ardently, they went to work. Now, when you buy pH Perfect Connoisseur, you have a base nutrient with the power to rival an entire shelf of standard base nutes and bloom boosters. It all worked out better than they imagined and pH Perfect Connoisseur had been the world’s most advanced base nutrient since its release many years ago and the flagship base nutrient in the Advanced Nutrients line. 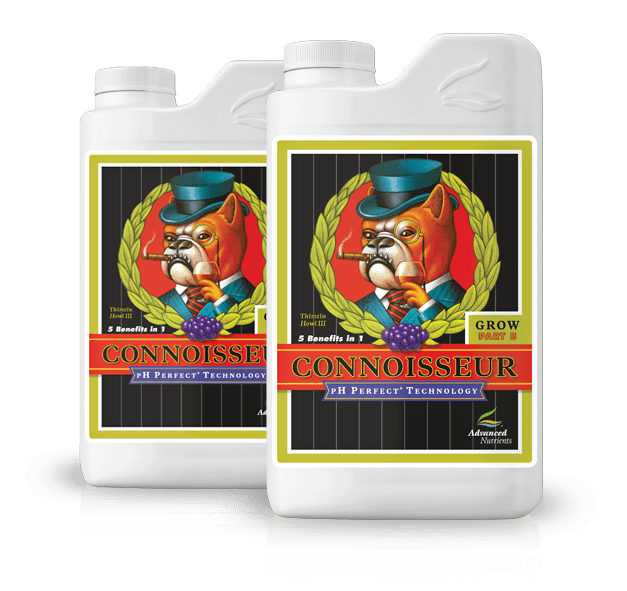 Connoisseur Grow A & B is a two(2) part PREMIUM vegetative base nutrient that is pH stable when mixed in water. pH Perfect Connoisseur is not for the grower who is struggling to get great results from other pH Perfect Base nutrients (all pH Perfect Base Nutrients are already dialed in to give great plant specific results – you should already be getting great results with pH Perfect Sensi for example before trying pH Perfect Connoisseur). In other words: Only experienced growers should use this unique formulation.